A new organisation has taken shape over the last 3 months to enable Family Practitioners to address problems in their day to day practice and to have a voice to be reckoned within the medicopolitical world currently dominated by Funders and SAMA. 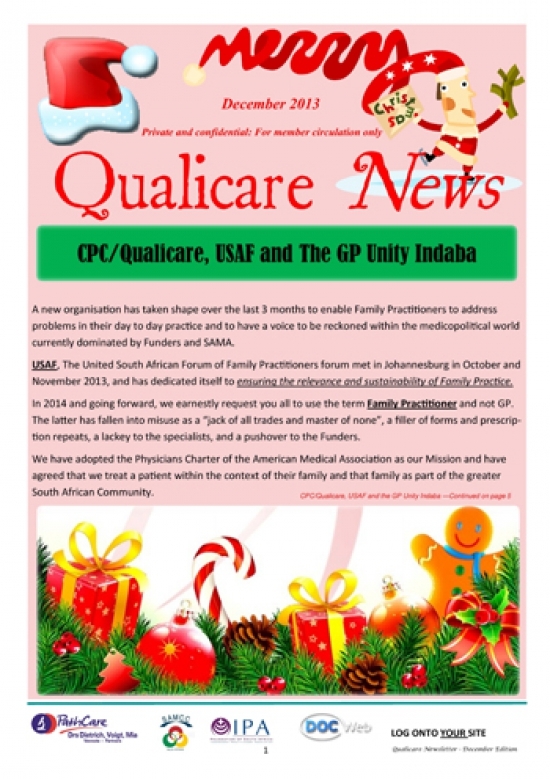 USAF, The United South African Forum of Family Practitioners forum met in Johannesburg in October and November 2013, and has dedicated itself to ensuring the relevance and sustainability of Family Practice. In 2014 and going forward, we earnestly request you all to use the term Family Practitioner and not GP. The latter has fallen into misuse as a “jack of all trades and master of none”, a filler of forms and prescription repeats, a lackey to the specialists, and a pushover to the Funders. The RIGHT of FPs to balance bill if they have not signed a DSP contract harmony. The democratic right of the FP to sign DSP contracts should they be in concert with the mix of his practice. The fundamentally unfair practice of Funders who pay the patient their portion instead of paying that portion to the FP, should we charge in excess of their deemed rate. The unfair manner in which fees are” clawed back” from Practitioners by funders if the patient is in arrears with their subs. The debacle around codes 0146 0147 and 0148 and the forensic investigations launched by the funders in an area where the guidelines are unclear Furthermore the unfair clawing back of pay-outs against these code numbers in the face of the on-going confusion as to when these rates and tariff numbers are applicable. The delivery of Primary Preventative healthcare by specialist at 300 % of the cost to the schemes and far in excess of the FP consultation fees. Up skilling of the FPs with a series of high level national workshops to re empower FPs to intervene more definitively. Your representatives on USAF from the SAMC are Prof Chetty, Dr. Dennis Dyer and Dr. Tony Behrman.